The Ribeira Sacra is a region located in the heart of Galicia, between the provinces of Lugo and Ourense, where the Miño and the Sil converge. It is precisely its location between these two great rivers that led to its first name. Its second name, Sacra, points to the sacred character of its architectural heritage, presided over by monasteries where the trace of Romanesque art is patent. The cultural richness and its landscape, in which the vineyards located in ‘socalcos’ stand out, make the Ribeira Sacra a favorite destination for lovers of outdoor sports, historical research and the tasting of wines with denomination of origin. Throughout the twenty Lugo and Ourense municipalities that make up the Ribeira Sacra, there are a large number of monasteries, churches and convents. All these buildings constitute its rich cultural and historical heritage that makes this place one of the largest concentrations of Romanesque art in Europe. 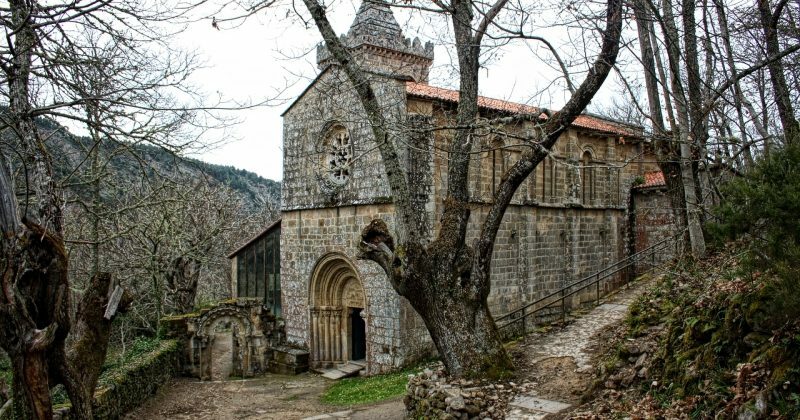 Near the Ourense del Sil border, in the middle of leafy forests, there are monasteries such as Santa Cristina de Ribas de Sil, in the town of Parada de Sil, and convents such as San Pedro de Rocas, belonging to Esgos. A little further away from nature, in the urban centers, there are the monasteries of Xunqueira de Espadañedo, Montederramo and San Vicente del Pino, in the municipality of Monforte de Lemos. This last town is the unofficial capital of the Ribeira Sacra and, in it, other monuments such as its Torre del Homenaje, from the 15th century, or its Condal Palace, from the 16th. One of the most recognizable elements of the Ribeira Sacra are the terraces or ‘socalcos’ that form the vineyards along the slopes and the canyons of the rivers. In autumnal times, the usual greenish tones of the plantations, which extend through 2,500 hectares, change forming a particular vegetable mantle in reddish and yellow tones. The quality of the grapes in said plantations led to the creation of the Ribeira Sacra Denomination of Origin in 1996. This recognition divided the wine region into five sub-zones, according to the particularities of the product: Amandi, Ribeiras do Miño, Quiroga-Bibei, Chantada and Ribeiras do Sil. The wine-making tradition of the Ribeira Sacra goes back to Roman times, and was maintained centuries later by monks in the Middle Ages. The production in this area has remained to this day. Currently, most wine producers in this area are small producers and less than 10% of the winemakers are large producers. The rugged orography of the vineyards, turn the Ribeira Sacra into a ‘heroic viticulture’. In this type of viticulture, characterized by the harsh working conditions that cause access difficulties for the harvesting machines, workers usually carry the full weight of the production. All this makes the native wines a unique gastronomic product, fruit of the millenary heritage and one of the most particular enclaves in Europe. If the landscape of the Ribeira Sacra is characterized by something, it is because of its heterogeneity. Its orography, formed by zones of a great inclination that are combined with valleys, propitiates that diversity. We can find vineyards that coexist with native forests, mainly chestnut trees and oaks, and mountain areas such as Cabeza de Manzaneda or Faro. To see the landscape in its immensity, there are viewpoints located at different points. Some of the most famous are: the Balcones de Madrid, located in the Ourense municipality of Parada do Sil; the viewpoint of O Duque, between Sober and Monforte de Lemos; the viewpoint of Cadeiras, in Sober, or the viewpoint of Cividade, also within Parada do Sil. The natural conditions of Ribeira Sacra encourage the enjoyment of different outdoor sports. In the area it is possible to make excursions on horseback or practice canoeing or kayaking through the spectacular canyons of the Sil, with the guidance of teams of experts in different disciplines.